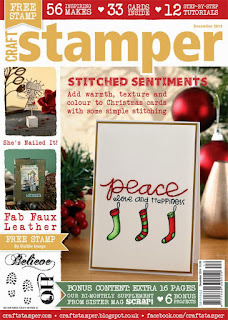 I love Tim Holtz 'Shabby Chic' technique and was even lucky enough to be able to share my take on it in December 2014's issue of Craft Stamper magazine for a Distress to Impress tutorial. Reaching for that tag substrate I used this technique using Antique Linen and Barn Door Distress Paint in combination with the Distress Damask stamp set. Sometimes I find the top layer needs a couple of coats to get a really good coverage, especially when you use a very pale colour on top of something so vibrant. The focal point was created on buff watercolour paper. I stamped the dragonfly image from the Classics #1 stamp set and painted the focal images with Hickory Smoke and Fired Brick Distress Stains. These were then covered with Distress Micro Glaze (applied with a fine brush - LOVE this stuff!) and heated before I dipped the whole lot into more Hickory Smoke Distress Stain. 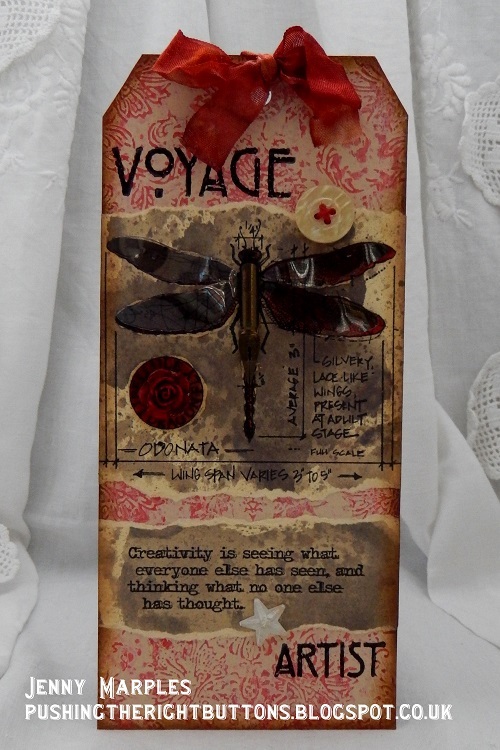 The dragonfly was finished with acetate packaging stamped wings and a pen nib, and I added a separate sentiment strip from the Life Quotes stamp set. 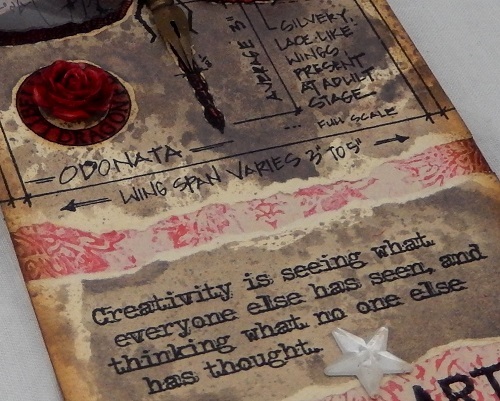 It was back to the words from the Classics #1 stamp set to top and bottom the whole composition, before I added an Idea-Ology button, altered Heirloom Rose and Mirrored Star (dulled slightly with Alcohol Ink Pearl Mixative). So that's the creative journey this Destination Inspiration has taken me on. Happy Birthday Jenny and Anne... love the project! Fantastic tag! Happy Birthday to both you and Anne! A beautiful tag! Jenny really love what the techniques you have used and the effects you have created . Love the staining ! 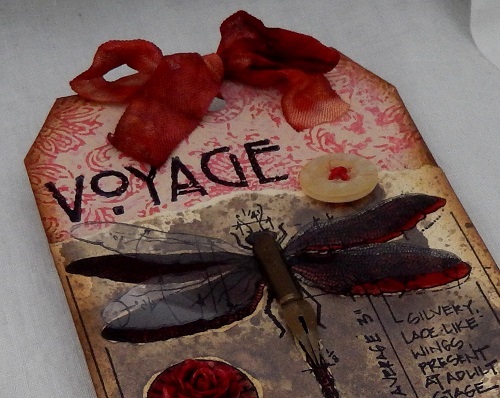 Stunning tag, Jenny - the colours are perfect for a rich Victorian look, and I love how you've created the dragonfly. 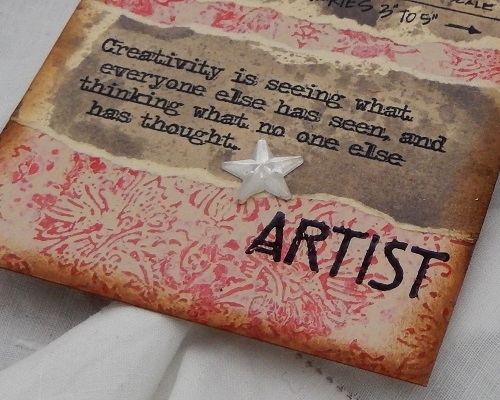 Fabulous work with the buff watercolour paper and the Hickory Smoke too - it looks like aged wax paper - love it! Wow, this tag is great. Love the red! Adore your theatrical colour choice Jenny and your dragonfly is stunning, beautiful tag. Very pretty, Jenny! I so love those colors and pretty background! The dragonfly is gorgeous and make a great focal point! Love this! Hugs! What a gorgeous tag Jenny! 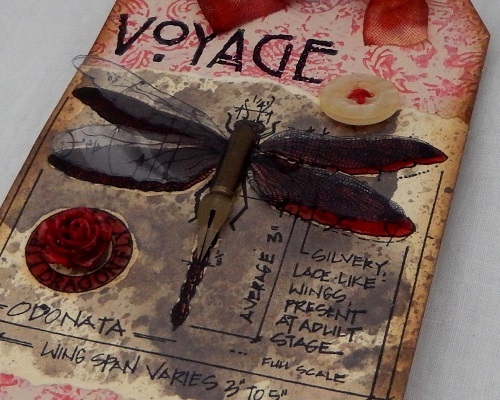 I love every single detail...your dragonfly is really an eye catcher:) Just wonderful. Brilliant, always brilliant, Jenny! Love following your art and this tag is no different. That dragonfly is one of all time favorites, so classic! Gorgeous Jenny and happy belated birthday to you and Anne, hope you both had a wonderful day!